On this lazy Sunday afternoon (February 2, 2013), I dropped by the Pine Street Starbucks, as I did a few errands during the day. I ordered a “Tall Vanilla Latte.” Christina took my order, and little did I know at that moment, she was decorating my cup. As I waited for my drink, I watched the bar barista working. I knew that I knew him, but something seemed totally different. Yes, it was his hair. It had been cut shorter, and was much lighter. I stepped up to the bar area, said ‘hello,’ and asked Kyle, “Is your hair different?” Sure enough, it was shorter and lighter. I complimented him, as I do think he looks very good as a platinum blonde! I laughed. Maybe this happens to everyone, but that’s actually the first time I have had that conversation with a barista! Thank you Pine Street Starbucks for incredibly friendly baristas. I wrote the above snippet on February 2, 2013. I didn’t publish it because I thought my readers wouldn’t be interested in one random conversation at a Starbucks. Then, today I saw this photo in my Facebook stream. It is the same store! I swear, the partners at Pine Street Starbucks really look like they have a lot of fun! Pink towels! Nice convo. Is this store in the downtown area? It is funny how partners are from one store to another. The other day the ASM of my local store saw me for a second visit on the same day and she said something like here again? I sort of was taken aback with that comment and said yea I went to the gym and then said to her just think if I didn’t come back you would not have that extra revenue! Small exchange but I keep on thinking why didn’t she say wow great to see you again. Not a big thing but in some ways that interaction bothered me. These are the things that make my day as a barista, when you can have fun and the customer joins right in. 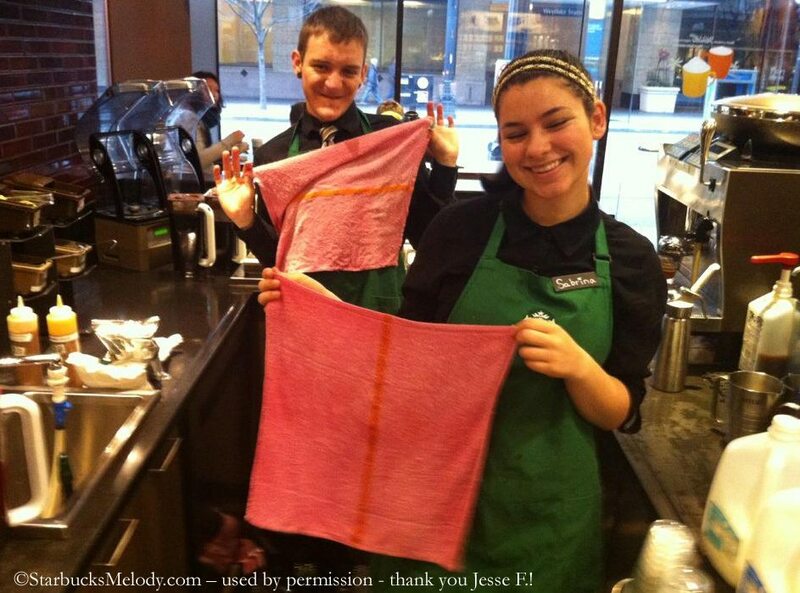 Thanks Melody for sharing as well as being a great customer who takes an interest in your barista! @Nathan – I am totally with you. I think it’s the little moments that really add up! That would have made me a customer for life as long as they were working there! I sure am and I bet so are many others. Yes, I can be “Mr. Critical” but as a customer this is the attitude and passion I am looking for. Melody, this post, and many of your others like it should serve as a positive inspiration. Being a Barista, as well as many other jobs, can be hard and thankless. But your job is what you make it. And if you find that you cannot be happy in your job, then I offer this tidbit: Fake It (happy, positive, courteous) Until You Make It. I’m sure you made their day as much as they made yours. It certainly looks like they have fun at that location! @Taylor de Sa – Thanks for the comment! The store manager read this and was very happy! @DadCooks – I am glad you like it. The truth is, I think that downtown Seattle really has their act together in every way. 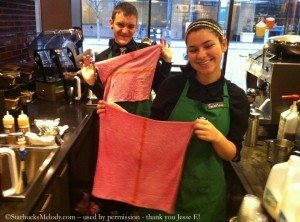 By the way – to all – I will edit the blog post too: Turns out the photos of the pink towels were taken just moments after the two baristas had cleaned up a big passion tea spill. Starbucks can be such a fun place to work 🙂 and that sounds like a fun one! Wow, that must have been a huge spill! And I love the fact that these two partners were able to have a great “connection” with you! They really emphasize the Starbucks ideal. Just thought I would add because I mentioned about how the ASM responded to my being at my local store more than once that partners during this snowstorm have been wonderful. They opened late yesterday but were very happy and engaging. Yes, Denise rather than repeat myself did speak in an earlier post about the storm. Streets today are virtually clear for the most part. It still amazes as the above convo you had Melody that shows the passion so many partners can have while others do not. @Purple1 – I am beginning to think this has nothing to do with Starbucks. This thing about passion is a human condition, not a Starbucks condition. I guarantee it, there are plenty of people who will never be happy in any job they have. And they don’t realize that many of the same skills they learn by being a barista translate well into many different careers. I have toyed with the idea about writing another article on the 5 Ways of Being, because I can assure you, those same green apron behaviors apply to just about every single profession out there. Who doesn’t want their doctor, their dentist, their lawyer, their hair stylist to be considerate, welcoming, knowledgeable, involved and genuine? Melody I think I have said this before that I agree with you about passion and customer service however I always thought that HS always madea point to have partners go that extra mile to interact with the customer like the experience you had at this store. Don’t get me wrong I have had some terrific interchanges with partners but the one I described surprised me.